Luke Dormehl: I realize that this is going to be one of the more controversial arguments we’ve had in a while. Right at the start, I’ll point out that I’m making an argument from a fan’s perspective. You can make a business case for the things I’m going to suggest being positive, but the market hates uncertainty, and getting rid of probably its biggest asset (yes, bigger than Tim Cook) is pretty much the definition of uncertainty. I’m a Jony Ive fan. Creatively, the decade that followed the iMac G3 is probably the most exciting one in Apple’s history. Over a ten year period, Ive — working closely with Steve Jobs — forever changed how we thought of personal computers with the iMac. It morphed from a fun, colorful, translucent “blobject” with the first-gen iMac to the equally fun, sunflower-inspired iMac G4, to the giant iPod look of the iMac G5 and through to the minimalist aluminum Intel iMac, whose design language we still have today. Alongside this, he brought us the iconic iPod with its white earbuds, the iPhone, the iBook, and any other number of beautiful designs that look like they belong in a museum. But since Jobs died in 2011, it seems something has changed. Your current MacBook or iMac may be technically the best computer you’ve ever owned, but is it your favorite? And does it have a design that stands out in a sea of similar-looking products? I’d suggest not. Very few artists can keep reinventing themselves over and over throughout their career. By now, we’ve got a pretty good idea of what Jony’s platonic ideal for a tech product is: and it’s an austere sheet of super-thin aluminum. Yes, there’s a bit of experimentation with new materials, but there hasn’t been an Apple product for quite a while that’s dropped jaws in the same way those earlier products I described did. In fact, most of the experimentation seems to have been about shearing off parts that users actually want, all in the name of simplicity. Other aspects of Jony’s work, particularly the software, have gotten actively worse since he took them over. Yes, I appreciate what he has done for computing. Along with Jobs, he created products that made design fans of us all. A whole generation of designers have been inspired by the great work he’s done. Wouldn’t you like to see what a few of them could do? Ive was around 30 when he designed the iMac. Imagine giving a young up-and-coming designer the opportunity to create their dream computer today. At least at one point, Apple was the company that was all about thinking different. Killian Bell: I do agree that Apple design has become somewhat boring, but the company is still creating products that are unlike anything else on the market. The most recent Mac Pro may not be the machine many professionals wanted, but there isn’t a desktop like it on the market with that much power. The 12-inch MacBook is also a thing of beauty, and while there are other ultra-portable notebooks out there, few are quite as slim and pretty. I get your point, though. It does feel like Ive has lost his passion since Jobs passed away, and we’re certainly not seeing the unique, market-changing designs we are used to from Apple. I also agree that there is room for fresh ideas, and that Apple should definitely be looking at recruiting new blood into its design team who can look at technology in new ways. But that doesn’t necessarily mean Ive should go. Why can’t we have the best of both worlds? Why can’t we combine new ideas from young talent with Ive’s experience and expertise? He’s been at Apple for so long now that his knowledge alone makes him a worthy member of the executive team. Getting rid of him won’t achieve much, and I think in the long run, it would be a tremendous loss for Apple. Luke: So surprised that you’re not taking a totally different side on this to me. I thought for sure that you’d point out that Apple is still making some beautiful devices, even if companies like (shock horror) Microsoft and Samsung are also producing some pretty stunning computers and smartphones of their own. Look, I certainly don’t think Apple has anything to gain from firing Jony Ive. As I noted, it would be terrible for Apple share prices, for one thing. Even if it means paying Jony Ive a salary for life to keep him away from other companies, I think that would be a good thing. But in terms of overseeing the design lab, and having everything produced in it feel like it’s part of Jony Ive’s vision for computing — yeah, I’d definitely be interested in a change. Killian: I don’t think the problem is Ive or a lack of fresh ideas, though. In some cases, it’s simply that Apple refuses to develop certain types of products. You mentioned Microsoft earlier, which gets a lot of praise for its terrific Surface Pro tablet/laptop 2-in-1. But as much as many fans would like one of those powered by a hybrid of macOS and iOS — as we’ve discussed before — Apple just won’t do it. It’s not that it can’t; it just won’t. The same goes for a touchscreen Mac like the Surface Studio. I think you’re forgetting that every other company has a similar problem. If you take away the products Apple won’t make and focus on those it is making, the entire industry has been stuck in a rut for years. No one is making a laptop or desktop or tablet with a revolutionary design that Apple missed out on. Smartphones are changing again, but that has only just started happening with the advent of new display technologies — and they’re essentially the same as they were before, only prettier. It’s the same thing we return to again and again: Apple is just too big to be experimental now. The issue doesn’t lie with Jony Ive; it’s that Apple as a whole is too scared to make substantial changes to insanely successful products that could backfire. It is terrified to radically redesign the iPhone in case it loses millions of customers to Samsung or Google or LG — which would not go do well with investors. It doesn’t have the freedom it did when it was fighting to become a major player and it didn’t have so much at stake. Luke: You’re massively underestimating how much power Ive has at Apple. He’s got as much sway, if not more, than Tim Cook when it comes to Apple’s overall direction. A lot of what you say is quite right, but let’s not pretend that Apple hasn’t been a market leader before and then come out with some extraordinary new technology that’s changed the game. But it’s an interesting point to ask: has Apple simply become too big to create a world-changing product in the way it did with all those great Jony Ive designs I alluded to earlier. Let’s turn it over to readers. 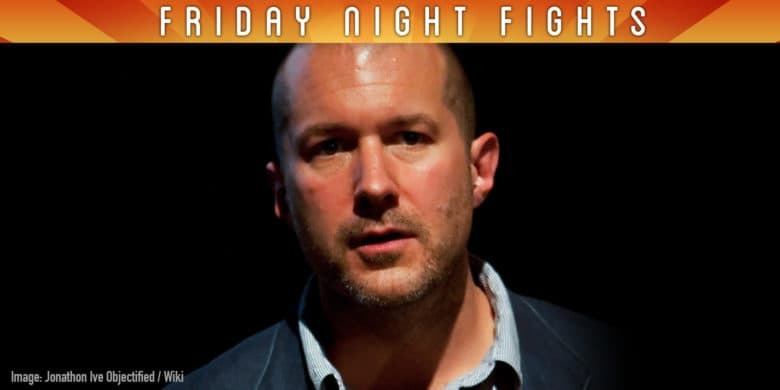 Have you been impressed by Jony Ive’s recent work? Would you be interested to see what a fresh pair of eyes could do in terms of releasing the next great product? Or are Jony’s best days still ahead of him? Leave your comments below. And have a great weekend.